He’s been this way for over an hour, and as word’s gotten out the audience has swelled to over 30,000. 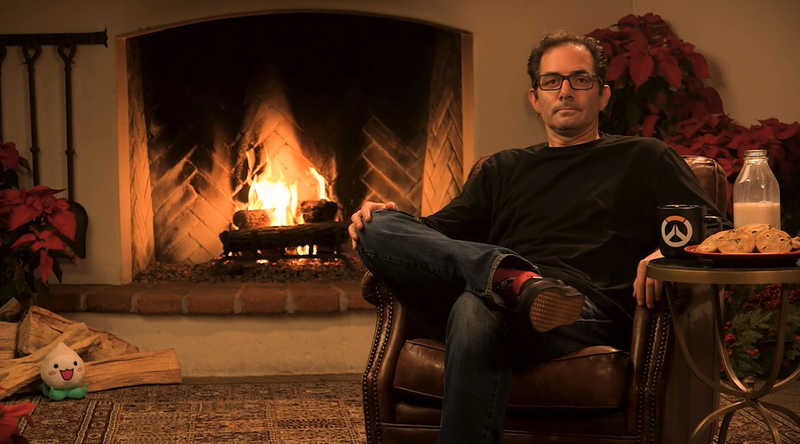 As Overwatch’s creative director, Jeff Kaplan has spoken in the past about how dedicated the team is to supporting the game and engaging with the community, even if that means working holidays. The Twitch stream opened a couple hours ago on an empty chair. A few minutes later Kaplan walked in and sat down. He’s been there ever since, sometimes crossing his legs, sometimes uncrossing them, and always looking, watching, waiting. And lest anyone think the stream is somehow a small segment of footage on loop, there have been a few weird moments sprinkled throughout, including one where Jeff gets booped by an off camera boom mic. In the other, less action filled parts, you can feel time passing as the rate of Jeff blinking changes. Three different blinking speeds, we’ll call them long stare, short stare, and turbo eye lash flicking, have taken shape in the stream like the ghosts of Christmas past, present, and future. The Yule Log started as an annual holiday program in the late 60s at WPIX, a TV station in New York, so that the employees wouldn’t have to worry about working. Plus the people of New York City, many of whom didn’t have fire places, could have the warmth of a crackling fire beamed into their apartments. In recent years it’s become a meme of sorts, just like everything else. In 2015 Nick Offerman of Parks and Rec sipped whiskey for forty five minutes as part of one. The absurdity of it was supposed to help sell Lagavulin. The Overwatch fans who have flooded the Twitch chat have been similarly intrigued and confused by the spectacle. It’s boring to the point of being impossible to look away. It’s actually the opposite of what this time of year’s supposed to be about. You should be having human interactions with other people. Catching up with family and friends. Not sitting with your phone or laptop transfixed by a motionless Jeff Kaplan. After all, what’s he doing there? What’s this all about? And most importantly how long will it go on? Like passersby at the zoo, the thousands who have tuned into the stream have set their expectations low. They’re not expecting some big, new Overwatch announcement, or an update on the game’s 2018 plans. The answers they’re seeking are more basic. “Do something,” is a common refrain you can see floating by in the chat log (which sometimes he does). As well as people begging him to eat some of the cookies nestled alongside a jar of milk on the table next to him. But so far he’s just continued to sit and stare, perhaps pondering the future of the game or that email he forgot to respond to from a few days ago or maybe just the fact the how many Christmas Eves ago he never imagined where he’d be on December 24, 2017. [Update—2:35 p.m.]: After three hours Jeff breaks his silence. He says the milk is probably poisonous and the cookies are a lie. Also there’s nothing in the coffee mug, something he demonstrated by picking it up and turning it upside down. Someone off camera meanwhile told him he had to do this for another seven hours. This has led chants of “#freejeff” to break out in the Twitch chat as well as on Twitter, with skeptics still shouting “looped!” The designer said that working on Overwatch and making it better is his happy place, not sitting in front of a fireplace making eyes at the camera and puffing his mouth out. Still, he persists. [Update—6:20 p.m.]: The stream is still live but now people have been watching long enough to detect particular moments when the feed appears to loop. While there are original skits peppered throughout the stream, like one where Jeff gets on his phone and starts playing Hearthstone, the performance always returns to a certain key set of movements, including the now iconic Jeff-spread. While it’s possible the Overwatch director is just one of the most brilliant actors of our generation, it’s more likely that the stream is a compilation of prerecorded bits edited together into an extended video. Still, that hasn’t stopped thousands who have now spent hours watching, or at least had the stream on in the background (as any Yule Log program is intended to exist), and have convinced themselves Jeff really is just sitting in a studio all day on Christmas Eve. It is, after all, a time for believing in the impossible.